Roseman writes of his return to Mount St Bernard Abbey in March 1984: "Brother Rufus had made his first, or 'simple,' profession the preceding April. In monasteries today, a monk having completed the customary two years as a novice makes his first vows in the presence of the abbot and community in the chapter room of the monastery. Following a time period of three to six years, the monk makes a reaffirmation of his monastic vows at a solemn ceremony in the church. 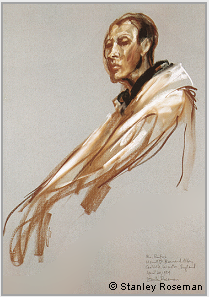 Presented here is the fine drawing Brother Hugh at Vespers, 1999, (fig. 2), from Roseman's sojourn at the Anglican Benedictine Abbey of Elmore in Berkshire. Brother Hugh stands in choir, his head inclined and eyes focused on a page of the Book of Psalms that he holds. Abbot Emeritus David Parry of St. Augustine's Abbey, is seen standing in choir in the photograph, (fig. 4), 1980. The eminent abbot edited and annotated a revised English translation of the Rule of St. Benedict for the 1,500th anniversary of the saint's birth. Roseman and Davis returned to Mount St Bernard Abbey in 1984. With a warm welcome back from the monks and their appreciation for his work, Roseman happily took up his paper and chalks and resumed drawing. From the series of excellent drawings is Brother Rufus in Choir, (fig. 6, below). The Institute of Art History of the University of Leiden acquired the drawing of Brother Rufus in 1985 by vote of the Institute's young art historians who, along with the Keeper of Drawings, selected five of Roseman's drawings from the monasteries. The Leiden Print Room houses an important collection of master drawings from the Dutch, Flemish, German, French, and Italian schools. Abbot Gilbert Jones and the community warmly welcomed back the two Americans for Christmas and the New Year 1980 that commemorated the 1,500 anniversary of the birth of St. Benedict. Roseman and Davis were given their former rooms in the monk's dormitory, joined the monks for the Divine Office in church and chapel, took meals as before with the Community in the refectory, and were included again in the life of the monastery. In the photograph above, Roseman is drawing in choir in the Abbey church. The neo-Gothic church was designed by the renowned English architect Augustus Welby Pugin, who is noted for the Houses of Parliament and for promoting Gothic revival architecture in the British Isles during the nineteenth century. 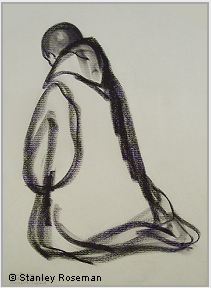 Presented here is the beautiful drawing Dom Damian, A Benedictine Monk kneeling in Prayer, 1980, (fig. 5). The figure of the kneeling monk is turned towards the high altar and seems enveloped in a cool light suggested by the gray paper. In this pyramidal composition with its pleasing geometric forms, Roseman depicts Dom Damian's voluminous black cowl in calligraphic strokes of black chalk. Variation in the strength of the line indicates the fall of light on the figure. Shaded passages accentuate the triangular shape of the hood and give rounded form to the monk's head bowed in reverence to God. 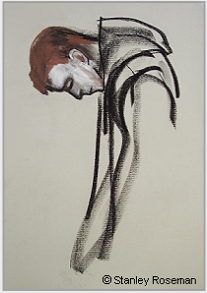 Drawing with a single chalk and an economy of line, Roseman has created a compelling image of a monk kneeling in prayer. Please note that the website has been republished for Internet Explorer 11. In Roseman's ongoing work on the monastic life, he drew monks in choir, the library, the scriptorium, at their workplaces, and in the refectory, as at Farnborough Abbey. The Musée des Beaux-Arts, Bordeaux, conserves the superb drawing Brother Andrew in the Refectory, 1980, (fig. 7). 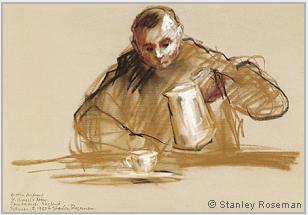 With a combination of chalks on gray paper Roseman depicts the Benedictine monk seated at a table and about to pour from a white pitcher into a teacup. The pyramidal composition places the figure in the center of the page. The artist's fine modeling of the monk's face with cool highlights and warm shading is complemented by the abstraction in rendering the monk's habit with lively passages of black and bistre accented by fluent strokes of black chalk. The Boston Globe praises Roseman's drawings as "impressive." The daily further states: "Roseman has captured the personalities of many individual monks while often managing to depict their lifestyles as well. . . . The artist's gray, brown, dark and light tones vary as subtly and surely as the monks who live out their discipline of prayer and work and meals in common." Prior David Higham, the Superior of the Benedictine Abbey of Farnborough, in Hampshire, warmly welcomed Roseman and Davis in December 1979 and again in 1980. The Prior related to them the history of the monastery and its association with the imperial family of Napoleon III. The Emperor, his wife, and son fled France after the fall of the Second Empire in 1870 and took refuge in England. Following the deaths of Napoleon III and the Prince Imperial, Empress Eugénie founded at Farnborough in the early 1880's a monastery dedicated to St. Michael. The abbey church contains a mausoleum with the tombs of Eugénie's husband and only son. By invitation from the Empress, the Benedictine Abbey of Solesmes, in France, sent several of its monks to establish a Benedictine community at Farnborough. Empress Eugénie died in 1920, and her tomb also lies in the crypt of the church. In the mid-twentieth century, with the increase of English monks at Farnborough, the monastery was incorporated into the Subiaco Congregation. Roseman drew the figure with a harmonious combination of black and bistre chalk lines and tonal passages, with reserved areas of the gray paper, complemented by sculptural rendering of the facial features with highlights in white chalk. The effective mis-en-page brings the viewer's attention from the face of the man of advancing years to the open Psalter. Presented here is the impressive drawing Brother Rufus in Choir. Fluent strokes of white and bistre chalks establish a strong diagonal to the composition and bring the viewer's eye to the face of the young monk who sits attentively in choir. The Trappist monk's fair complexion is complemented by his dark hair and the black scapular beneath his white cape. With fine chiaroscuro modeling of light and shade, Roseman has rendered the distinctive facial features of Brother Rufus and a resoluteness of expression in this engaging depiction of a young Englishman dedicating himself to a monastic life. The Keeper of Drawings Dr. Janno van Tatenhove expressed his gratitude to Davis when he brought the work to Leiden and said that Roseman's drawings are the first by an American artist acquired for the Print Room. Dr. Van Tatenhove reiterates in his cordial letter to Roseman that "until now we had no American drawings at all." "We all need to get the balance right between action and reflection. With so many distractions, it is easy to forget to pause and take stock. Be it through contemplation, prayer, or even keeping a diary, many have found the practice of quiet personal reflection surprisingly rewarding, even discovering greater spiritual depth to their lives. . . .
"For Christians, as for all people of faith, reflection, meditation and prayer help us to renew ourselves in God's love, as we strive daily to become better people. The Christmas message shows us that this love is for everyone. There is no one beyond its reach." Roseman's work on the monastic life, a life centered on contemplation and prayer, was begun in England in 1978. Over the years the artist's oeuvre grew to include some sixty-five monasteries in the British Isles and Continental Europe. This unprecedented and ecumenical work comprises communities of monks and nuns of the Roman Catholic, Anglican, and Lutheran faiths. Stanley Roseman is an artist of the Jewish faith. The Prophet states in the Book of Psalms: ''At midnight I rise to praise you, O Lord" (Ps. 119:62) and "Seven times a day I praise you" (Ps. 119:164). "I love the Lord, because he hath heard my voice and my supplications. From Roseman's sojourn at Elmore Abbey is the excellent drawing Dom Simon at Vespers, 1999, (fig. 3). The tall, red-headed, young Englishman is depicted standing reverently in choir. The drawing of Dom Simon is rendered with vigorous, broad strokes of black chalk defining the monk's black cowl, with hood resting on his shoulders. His head is bowed deeply to his chest. His face in profile and with eyes closed is finely drawn and expresses an intense concentration. In this impressive drawing, the artist has effectively conveyed a young man's prayerful devotion to God. Psalmody is the foundation of the Divine Offfice, the round of communal prayer that is central to the monastic life. Vigils, or the Night Office, is followed by the daytime Offices of Lauds and Prime in the early morning, Terce at mid-morning, Sext at midday, None in the early afternoon, Vespers in the early evening, and Compline at the end of the day. 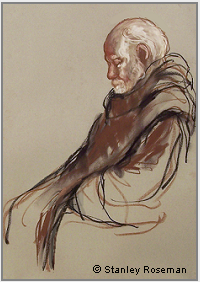 The subjects in Roseman's paintings and drawings in monasteries in England range in age from young men making a commitment to the contemplative life to the oldest living monk in the twentieth-century Western Church: Dom Sylvester Mooney, Abbot Emeritus of Douai Abbey, who was 98 years old in 1984 and whose portrait in the British Museum is featured on Page 2 - "Returning to England Continued." A selection of Roseman's paintings and drawings from St. Augustine's Abbey, along with the artist's remembrances of his first days in a monastery, are presented on the website page "From the Artist's Memoirs." Included are works in the Victoria and Albert Museum, London, and the Musée des Beaux-Arts, Rouen. In 1987, the monks of Nashdom Abbey moved to a new location, near Newbury in Berkshire, and took up residence in the former Elmore House, which dates back to the early eighteenth century. Elmore Abbey constructed a beautiful, oak-framed chapel which was consecrated in 1995. Roseman's sojourn at the Anglican Benedictine Abbey of Elmore in 1999 resulted in a suite of excellent drawings, which includes the present work Dom Francis, Portrait of a Benedictine Monk in Prayer, (fig 11). The present work portrays Dom Francis in profile, his head lowered in prayer. In the portrait there is great sense of detail with minimal use of line and tone. Descriptive contours in bistre and black chalks are complemented by passages of bistre chalk, as in the rendering of the fringe of hair on the monk's head. Reserved areas of the gray paper enhance the monk's fair complexion, shading in bistre chalk adds warmth to the shadows, and highlights in white chalk illuminate the cranium and face of Dom Francis. Roseman has expressed in this beautiful portrait the man's dedication to the contemplative life. 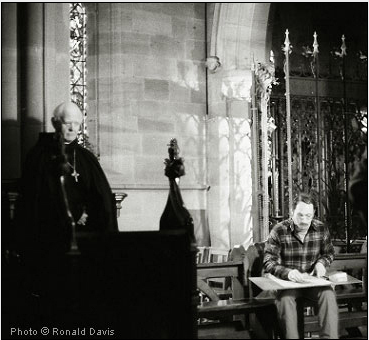 The artist and his colleague had met Dom Francis at Nashdom Abbey in 1983. When they returned the following year, their friend had been recently appointed Prior, an appointment that the annual Nashdom Abbey Record, 1984, notes as "a decision which gave much pleasure outside the community as well as within it.'' Dom Francis' responsibilities in the Abbey were diverse and included those of infirmarian and organist as well as arranging receptions for special events, such as interfaith dialogues. 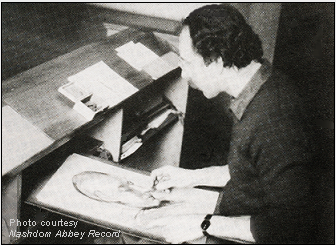 Having drawn a portrait of Abbot Wilfrid the previous year, Roseman asked to also include in his work a drawing of Abbot Godfrey, the result of which is the beautiful drawing Abbot Godfrey in Prayer, 1984, (fig. 10). The Abbot is depicted seated in choir as he prays and meditates, his head inclined, his eyes lowered in reverence to God. Roseman resumed his work at Nashdom Abbey the following year when he and Davis returned to England. Abbot Wilfrid had retired and the present abbot Dom Godfrey was equally enthusiastic for Roseman's work on the monastic life and warmly welcomed back the artist and his colleague for a third sojourn at Nashdom. Roseman has rendered the Abbot's face with fine chiaroscuro modeling of the chalks. 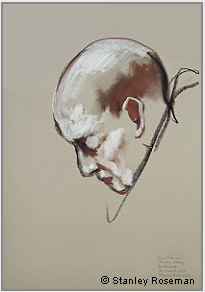 The warm shading in bistre chalk is complemented by luminous highlights on the monk's cranium, forehead, and cheek. Linear description in white chalk renders the hair and closely cropped beard. The Benedictine habit is drawn in calligraphic strokes and tonal passages of black and bistre chalks with reserved areas of the gray paper giving sheen to the black material. "Thank you so much for your great kindness in sending me your drawing of a monk from Mellifont Abbey. It was a very kind thought on your part and we are very happy to have it. Benedictine monasticism in the Church of England dates from the nineteenth century with the emergence of several religious communities that adopted the Rule of St. Benedictine as the basis of a life of prayer and work. In 1914 a community of Anglican Benedictine monks was established in Pershore, Worcestershire. Some twelve years later, the monks resettled on a former private estate called Nashdom, in Buckinghamshire. 9. Roseman drawing in the choir of Nashdom Abbey. 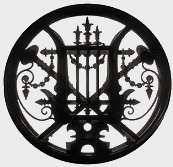 A fascinating connection of history and events brings together Roseman's association with Farnborough Abbey and the Paris Opéra. Napoleon III commissioned the building of the new opera house, "Le Nouvel Opéra," also called the Palais Garnier after the name of its architect Charles Garnier. The splendid opera house, begun in 1862, was completed under the Third Republic and inaugurated in 1875. The Abbot of Solesmes Dom Jean Prou speaks in a meaningful letter about the relationship between Roseman's drawings on the dance and his work on the monastic life. The letter is quoted on "Correspondence from the Monasteries" - Page 2. The Rule of St. Benedict allocates Chapters 8 through 18 to the celebration of the Divine Office. The chapters include instructions on the arrangement and number of Psalms for each office of the day and night. Chapter 19 concerns the discipline of Psalmody. whom Roseman drew on his return to monasteries in England. 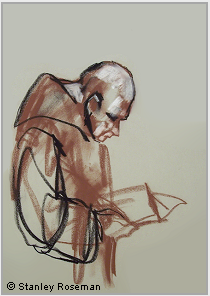 Drawings of Monks at Vigils, Lauds, and Compline. 1. The Rule of St. Benedict English translations by Abbot David Parry, O.S.B., Households of God, (Darton, Longman &Todd, London, 1980). 2. David Higham, O.S.B., History and Guide - St. Michael's Benedictine Abbey - Farnborough, (Farnborough, Hampshire, 1978), pp. 2, 3, 4, 13. (Paris, Bibliothèque Nationale de France, 1996), p. 11. 4. Nashdom Abbey Record, (Buckinghamshire, Nashdom Abbey, 1984), p. 6.